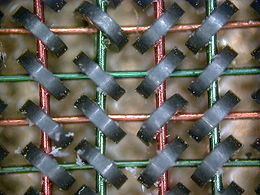 Today in 1956, Jay Forrester of MIT was awarded a patent for his magnetic core memory. It became the standard for computer memory until it was supplanted by solid state RAM in the mid-seventies. It has continued to be used, however, in special environments (e.g., on the space shuttle), because its content was not lost when the power was shut off. This entry was posted in Computer history, Memory, This day in information. Bookmark the permalink. Not only the space shuttle… Well I recall how we had to decide, in the late 70s, whether to buy 16K of RAM for the Nova minicomputer in solid state or core. We chose the core version because it did not forget – meaning we wouldn’t need to re-read the software from punched paper tape every morning.